Once you start to suspect CMPA, the ideal situation is that you eliminate dairy from your/little one’s diet and all symptoms disappear immediately. You confirm CMPA properly, you have a solid diagnosis, and you’re free to continue your dairy free and hopefully reaction free life for the foreseeable future. Unfortunately sometimes it doesn’t quite work out that way, and CMPA is often so complex in the way that it affects each child that it can be really tricky to get to the bottom of. Here I’m going to run through some troubleshooting ideas with you, why you might not be seeing an improvement and discuss what to do when the symptoms haven’t completely gone away. For more information on CMPA check out our Breastfeeding with CMPA page and for a list of all my dairy free resources head over to the Breastfeeding With CMPA Directory. Have you been dairy free long enough? Often when I chat to mums who are worried that their child’s symptoms haven’t disappeared, but they have actually only been free from dairy for a week or so. Without a doubt some people do see improvements this fast, but it is likely to take a little bit longer. I advise mums to be dairy free for a period of 6 weeks – this allows 3 weeks for your system to become dairy free, and then another 3 for baby. Because your baby will continue to be exposed to cow’s milk protein for the first few weeks after you’ve given up the allergen (although probably less than usual) you may still see reactions. Be aware that mucous filled nappies (often a tell tale sign of CMPA/food allergies) are a sign that the gut has been irritated and is now repairing itself, so these may continue for a little longer than other reactions. Things like poor weight gain and eczema also often take a little longer to resolve than other symptoms, so I really wouldn’t be too concerned if something like eczema is still around 4-5 weeks in. By week 6 I would expect to see some real improvements, even if you’re not totally there, so if you haven’t – or worse, you’ve seen worse reactions/new problems then keep reading. Could it be another allergy? This is a tricky one, because I really feel strongly against mothers eliminating multiple allergens from their diet really early on. It has the potential to be really confusing when you’re trying to confirm allergies, and it will almost definitely result in you unnecessarily vastly limiting your diet. 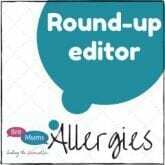 Multiple allergies are rare, much rarer than having only CMPA, but they do happen. If you suspect, after 6 weeks of being dairy free, that there’s something else going on, you may need to eliminate something else. What that something could be is even harder, because it could quite literally be anything. The best thing to do in this case is start a food and reaction diary, which I would suggest you do as early on as you can. More on this further down. Something else than may help you narrow down the options are looking into your and your partner’s family history, and asking relatives about any possible food allergies they might have. If you haven’t got a food diary, or you’re struggling to find a pattern then we can look at what is more likely to be causing issues for your little one. The most common childhood allergies are known as MEWS – Milk, Egg, Wheat and Soya. As we know already, milk and soya proteins are very similar and this means that somewhere between 30-50% of CMPA children will also react to soya protein. Because of this I would suggest that soya be the next thing you cut out, unless you have reason to believe something else might be a problem (due to food diary/family history etc). I would certainly suggest not replacing your milk products with soya ones, and if you do this and notice that symptoms intensify then this is most likely why. If soya isn’t the issue or doesn’t help I would look at egg next, and then wheat. Hopefully by this stage though your food diary will offer more help to pinpoint what’s going on. One reason you may not be seeing any improvement on symptoms is that it isn’t Cow’s Milk Protein Allergy. There are other causes for lots of the symptoms, and lots of them are also normal baby behaviours to a degree. Confirming the allergy is really important, so if you’ve eliminated dairy and seen no improvement, and tried the tips below and you’re not any further then I would recommend reintroducing dairy. If symptoms don’t increase or become more severe it’s quite likely a dairy allergy isn’t your problem. There are lots of other things that can cause CMPA symptoms, and hopefully you spent some time eliminating these before going down the CMPA route. You may wish to consult with an IBCLC, to check latch and for any tongue or lip ties (please please have someone qualified check this – over 10 midwives told me Dil had no tongue tie, it took an expert 20 seconds to see that he definitely did). If that hasn’t helped then have a chat with your GP and ask for a paediatric referral. The very first thing you need to do is be sure you’re being as dairy free as you think you are. I’ve seen many many situations when something has slipped through the net, and a mum is consuming dairy without even realising. It happens to many of us – it may be something you assumed was safe, or something you assumed your partner has already checked. It may be that you’ve accidentally picked up a slightly different version of something that is safe, and the one you’ve just bought isn’t. It may be that the manufacturers have changed the ingredients, and added milk in to the recipe. For whatever reason there is a possibility that milk has sneaked back into your diet so that’s the first thing you need to check. I would advise going right back to basics, and checking absolutely everything you eat every time you eat them. This is definitely best practice in general for being free from an allergen, but I know that we all get a little complacent. Common things that people seem to get caught out by include wine (yep, lots of wine contains milk plus more allergens), vitamins or supplements (Pregnacare contains soya for example) and incorrect info when eating out – make sure you’re getting the right information, and if you don’t trust them then don’t eat there. I would recommend starting a food diary as soon as possible, definitely as soon as you start to suspect there may be something else going on. I would advise including everything you consume rather than just main allergens, remember your baby may be allergic to something that isn’t one of the top 14. I would also include drinks, vitamins/medication and if it wasn’t you who was cooking the food (eating out/at a friends/etc). I would also keep a note of reactions or symptoms, detailing if there are any days when things seem particularly worse, or better. Noting down and taking photos of any rashes, bad nappies and eczema will help you compare whether there is any improvement or not. Include things like baby seeming unsettled, sleeping more or less and how content they are – these things may not be related (babies never sleep, allergies or not) but it’ll help give you a really full picture. Remember that environmental allergies are also a possibility, especially if you’re seeing skin problems like hives/rashes or even eczema. In your food diary also make a note if you visit with any animals, if you change your washing powder, get a new bubble bath etc. All of these things could contribute to your baby’s discomfort, so you may want to try changing them if you’re having problems. Opt for a gentler washing powder, or try washing baby in water only for a week or so. Make one change at a time so that you’ll easily be able to see which was the problem if symptoms resolve. Remember that there are lots of people out there who can help you, so don’t feel that you have to struggle or figure it out alone. If you’re a breastfeeding mum and suspect your baby has a food allergy you can join my really supporting Facebook group, and if you’re struggling to get to the bottom of your little one’s symptoms you should reach out to your GP or health visitor and ask for a referral. If you face any resistance you can refer them to the MAP guidelines which advises a dietitian referral for confirmed CMPA and a paediatrician referral if you’re suspecting other allergens. 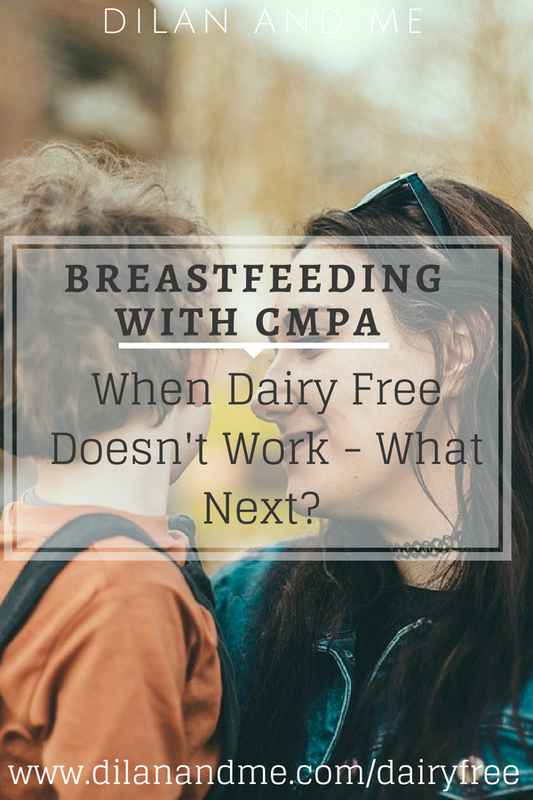 For more information about CMPA do check out my other breastfeeding with CMPA resources, including frequently asked questions, a comparison of dairy free milks, how to confirm CMPA and the dairy and soya free treat list. Visit the breastfeeding with CMPA directory for a full list of all posts.